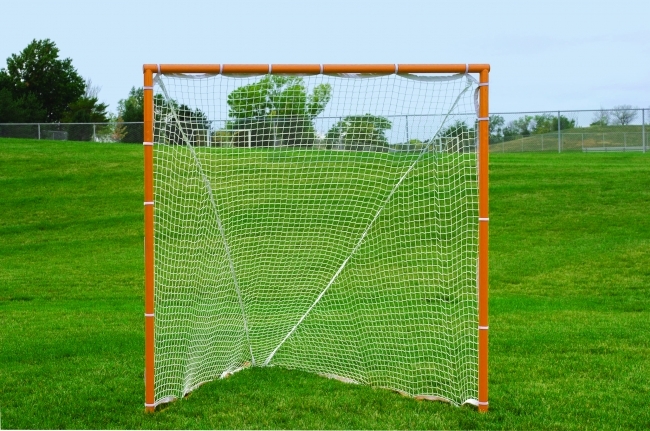 These goals meet all NCAA and National High School Federation rules for competition play. Popular flat iron style base allows use indoors or outdoors on any surface. 1-1/2" (1.9" O.D.) schedule 40 pipe framework has thick ground bars allowing sturdy ground staking or use of ballast bags to stabilize. Orange powder coated finish. Includes four ground anchors. 6' (h) x 6' (w) x 7' (d) opening. Sold in pairs. Nets included. Nets not returnable once opened. One-year limited warranty. Approx. shipping weight: 145#/pair.